As I mentioned in an article last week, I am interested in joining my local Well Armed Woman chapter. I contacted the chapter leader and was immediately excited. Why? Because this particular meeting was going to be about picking a concealed carry holster. Since I have reached a point in my training that I feel comfortable enough to carry concealed, I am all about learning more about holsters. There are so many options out there and honestly, I didn’t know where to start. I was concerned about spending lots of money only to find that the holster I selected is not what I want. After going to this meeting, that concern was validated and I am very glad that I waited. When I arrived, I was immediately greeted by the chapter leader. I signed in and went straight into the room. A brief introduction was made by a female range instructor, followed by some Q&A time. 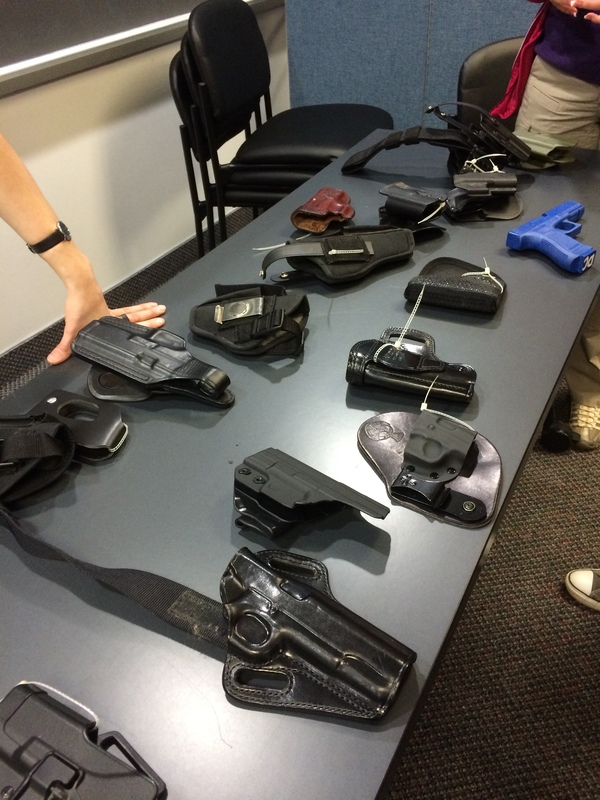 We were then set free in the room to try on all of the different types of holsters. There were 4 tables set up with different sizes and shapes of holsters. The instructors were there to offer advice/information regarding material, which belts to use, and where to place a weapon you’re trying to conceal. As we all know, concealing a weapon on a woman is significantly harder for women then it is for men. We have tighter clothes, smaller pockets, and items of clothing with thinner material. One of the very first things we can rule out is pocket holsters. I can hardly fit my car keys in my pocket, let alone a 9mm handgun. Next, we determined that any holster that does not fully cover the trigger/trigger guard on your weapon is not exactly a safe choice. Not only can clothing zippers and strings get caught on it and pull, but it also gets the shooter in a bad habit of immediately placing their finger on the trigger before removing the gun. We also discussed the pros and cons of having a ‘snap’ over of your gun to hold it in your holster. This not only makes it hard for someone to take your gun, but it also provides an extra step for you to take when you’re already in a bad situation. The instructor showed 2 alternative options. 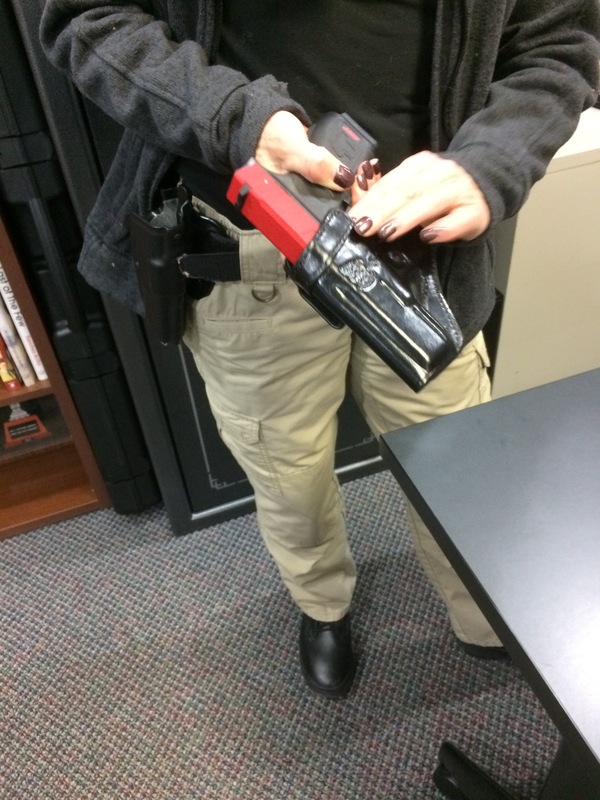 One holster was specifically made for her gun which allowed it to lock in tightly. 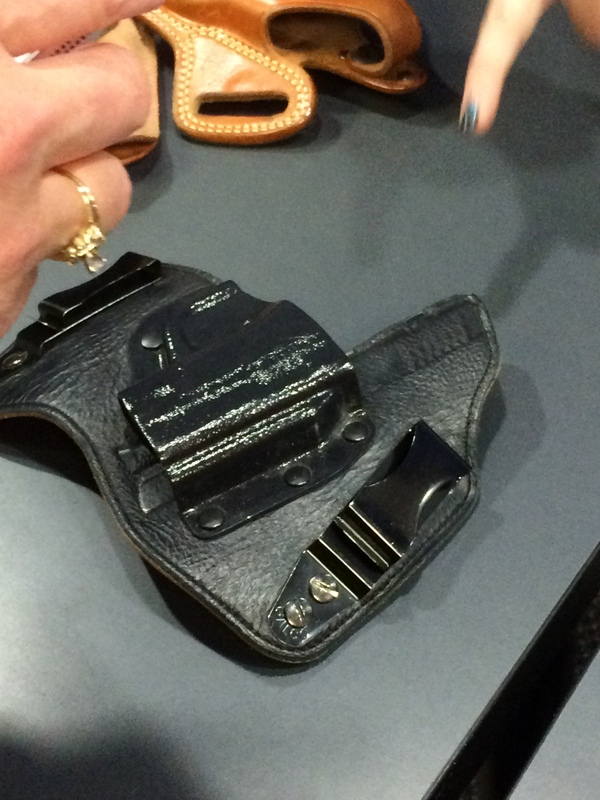 The second option had a latch that you can to push forward in order to release the gun from the holster. This, in my opinion, was a great holster. As I made my rounds from table to table, I tried on both leather holsters, Kydex holsters, and a combination of Kydex and leather. The fully leather holsters were a little unsturdy when faced with the weight of the handgun. Part of this could have been blamed on the belt I was wearing, but it was just falling forward. 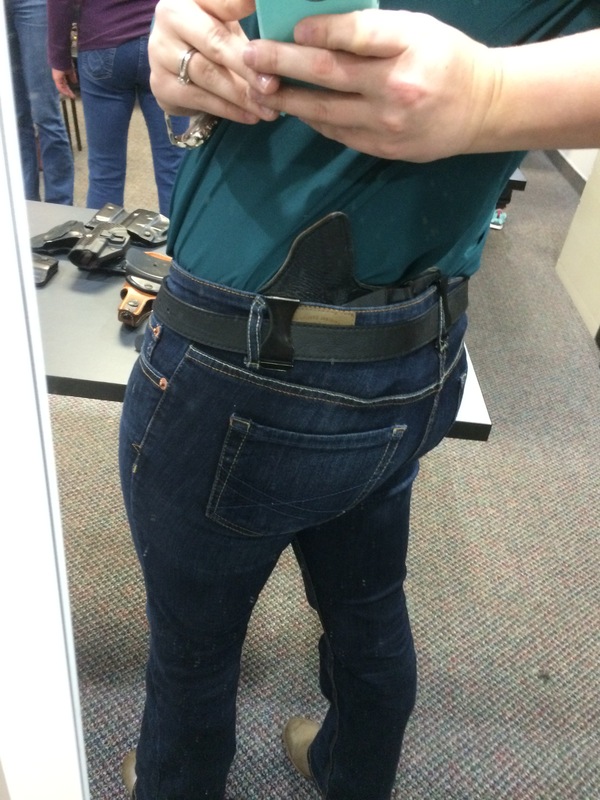 The Kydex holsters were surprisingly comfortable, although I felt it was a tad too bulky. 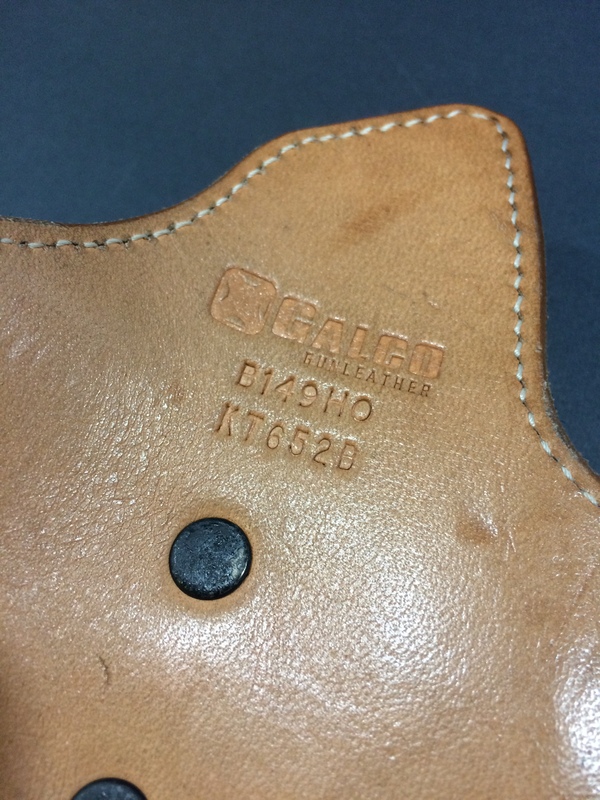 My favorite was a Kydex/leather holster called Galco King Tuck. It fit inside of my jeans and clipped over my belt to help keep it in place. It fit nicely in the small of my back and would easily conceal a 9mm handgun. 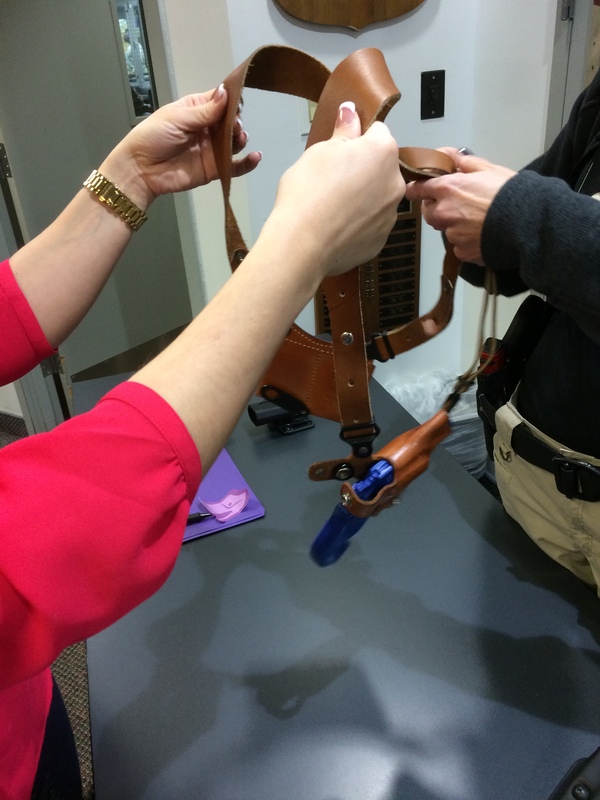 TIP: To help break in a leather holster, add leather conditioner to the inside of the holster. Wrap your UNLOADED handgun in saran wrap and work in and out over and over again. 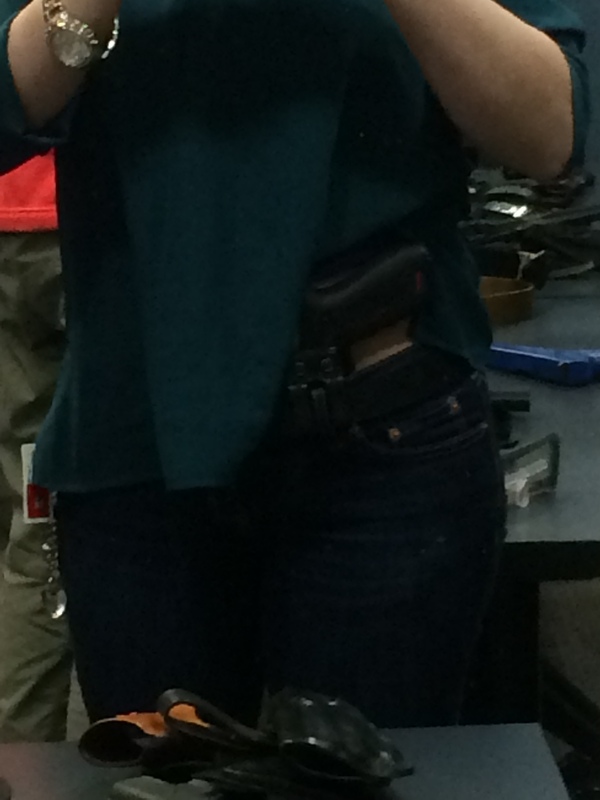 This Kydex holster is held up by my belt. Didn’t fall forward like the fully leather holsters, but did sag a little bit. This was one of the leather holsters that I did like. It clipped to the inside of my jeans. It was extremely comfortable and laid close on my abdomen. Below are photos of the Galco King Tuk (my favorite holster of the night). I took photos of the holster with and without a gun, just to give a better idea of how it fits into the back of my jeans. 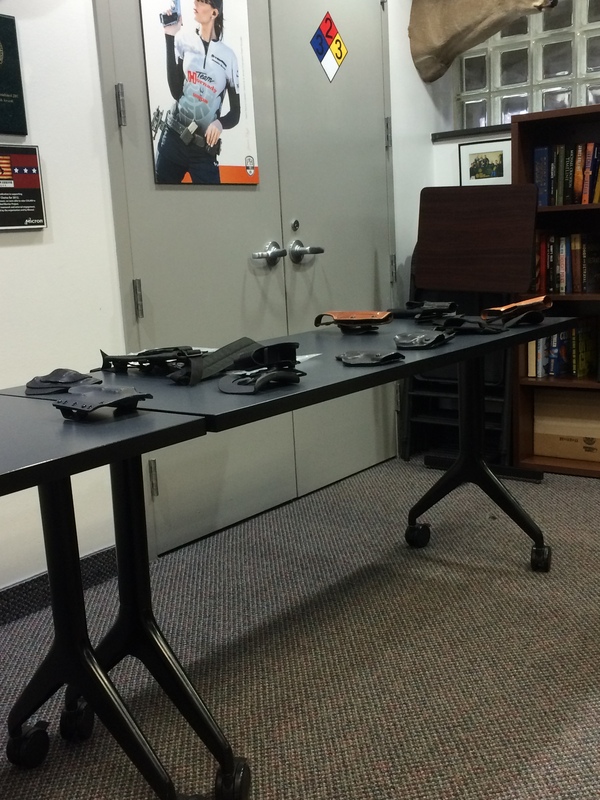 I then went over to the shoulder holsters that were laid out. I had thought about purchasing a shoulder holster in the past for when I want to carry during winter months. However, once it was held up and we put it on, I noticed that the gun in the holster points backwards. At first, this wouldn’t seem like too much of a big deal, except this means that you’re gun is pointing at people behind you. One of the first rules you learn when shooting is to always keep the gun pointed in a safe direction. 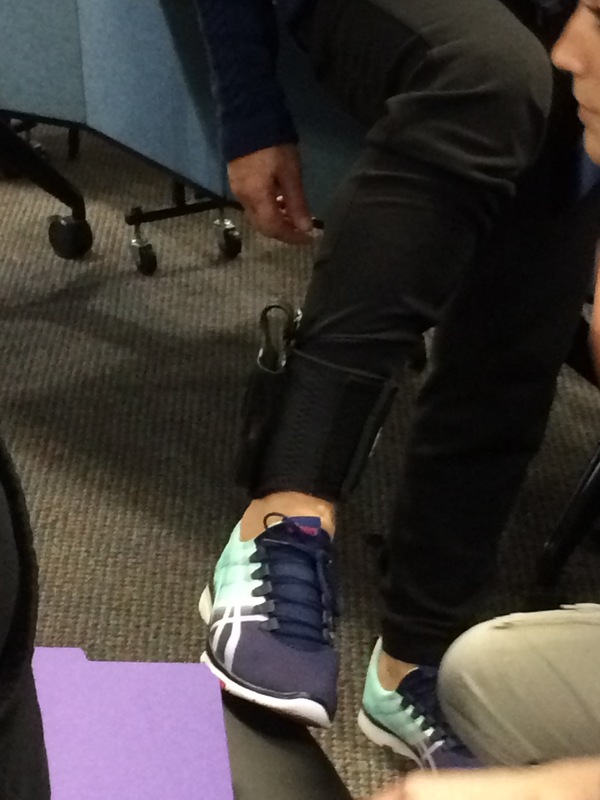 The next holster I tried on was an ankle holster. I wouldn’t necessarily use this as my primary weapon, but it would definitely be a good back-up. The instructor also brought up the point that this would be easier to access in the event that you’re sitting in a car or laying on the ground during an attack. 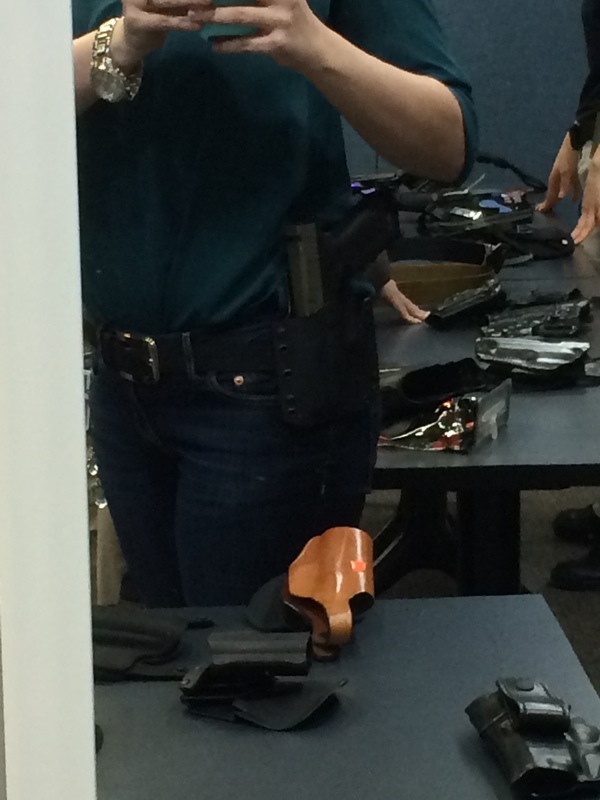 The next couple of holsters I tried on were different style ‘belly belts’. They kind of reminded me of an ace bandage. Although they were extremely comfortable, having velcro hold my handgun up makes me a little uneasy. Next, I looked over a table of purses made for concealed carry. Built-in holsters and removable holsters were both options. I’ve always been hesitant about purses because people can easily take them from you. If an attacker demands your purse, you are left either unarmed and/or having to call the police to inform them that a criminal now has your handgun (that’s assuming you didn’t have your phone in your purse). In the event that you would prefer to carry in your purse, the instructor recommended using a revolver because the slide won’t catch on any fabric and you can continue to shoot. The last one we spoke over was a thigh holster. We were advised to always place the holster on the inside of your non-dominant leg. This makes it easy to grab and easier to conceal. (If gun was placed on the outside on your dominant leg, you will have a gun print showing through your dress). An important thing to remember when you’re considering to carry a concealed handgun is to keep it with you 100% of the time. Practice how to draw from your holster and get comfortable wearing it. The meeting was extremely informative and I really enjoyed looking into all of the different options. To end the evening, we grabbed our guns and filled the lanes. It never hurts to get a couple rounds of target practice in! 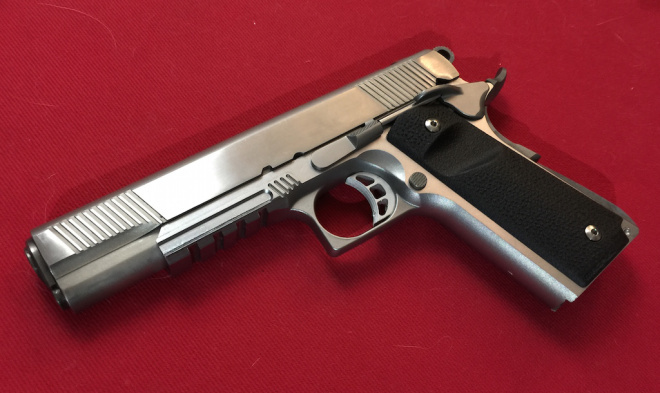 On March 17, 2015, we were informed that the Texas Senate was one small step away from approving a bill that would allow people to openly carry handguns in the state. Read full article on KHOU. Texas is one of 6 states who do not permit open carry of handguns, even though open carry of shotguns and rifles is permitted in the state. Though some have their own sets of reservations with the passing of this law, state Senator Huffman believes that these trained citizens will act responsibly. Plus, this bill does not permit just anyone to openly carry their firearm. 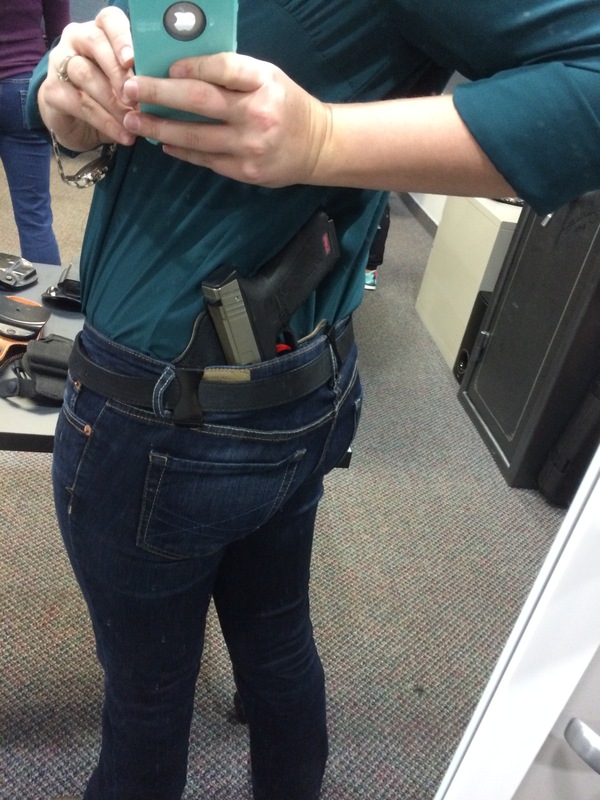 In order to openly carry, one must already hold a license to carry concealed and their firearm must be carried in either a shoulder holster or a belt holster. Documentation of proper training (classroom and firing range instruction) and a criminal background check are required in Texas in order to obtained a CCW. In addition to Bill 17, the senate gave final approval to a proposal that would allow certain people with proper licenses to carry concealed on college campuses. A House panel is set to consider both gun bills on Tuesday. We all know that Will Ferrell is vocal about being pro gun-control, but this most recent (poor) shot at humor is just too much. In an effort to push gun control, this video on ‘Funny or Die’ attempts to confront the ‘issue’ that criminals can purchase guns without forgoing a criminal background check. Anyone who is willing to spend 5 minutes doing research knows that this just isn’t true. If you don’t want to spend 5 minutes, that’s ok. I’ll do it for you. Arizona requires background checks in order to purchase a firearm if you do not have a license to carry concealed—> Click here. NOTE: In order to receive a concealed carry license in AZ, what do you have to do? Oh, right. Forgo a criminal background check —> Click here. Nevada requires that all licensed dealers perform a criminal background check on prospective buyers —> Click here. Their argument is that people can avoid getting a background check by going through unlicensed dealers, which by the way is also illegal. Their state requires that any weapons bought or sold must go through an FFL dealer. When talking about Nevada, they also claim that you can just head over to California and start selling your guns. First of all, when has trafficking ever been legal? Second of all, California background checks ARE required in order to purchase a firearm —> Click here. Instead, they like to make you think that there is some sort of ‘loophole’ that allows criminals to avoid a background check and somehow receiving access to unregistered/illegal firearms, which they supposedly can just take to another state and sell to more violent criminals. Also– this ad only further validates the gun rights argument that criminals don’t obey laws I.e. avoiding background checks and illegally trafficking/selling guns. I highly doubt this was intentional, which only further proves how ridiculous this video is. So recap: this video uses actors to try and claim that criminals can legally get their hands on guns, which is not true. It also validates the gun rights claim that criminals don’t follow gun laws. Conclusion? Implementing more restrictive gun laws won’t keep criminals from purchasing or selling them illegally. Hey, the ad said it. Not me. A pro gun-control video was released this week by States United to Prevent Gun Violence in hopes to ‘shame’ first-time gun buyers out of their purchase. Their “every gun has a history” campaign is used for no other purpose than to make people feel guilty to exercise their second amendment right to protect themselves. Throughout this video, the ‘gun salesman’ discourages these individuals by telling them that the very gun they’re looking to purchase was used to murder innocent people. The first woman to come in is looking for advice on what type of gun to use for protection. The salesman then pulls out a .22 revolver and says “It’s the easiest gun we have to use. It is our most popular one. It’s a .22 caliber, 6 inch revolver. It’s also a gun that a 5-year-old found in his parent’s bedroom and went down and shot his 9-month-old baby brother with it”. The next customer is looking for a 9mm semiautomatic pistol. He is given the story of how the gun he has in his hands was used by a 2-year-old in Wal-Mart who shot his mother. He does the same thing with a shotgun and an AR-15. Instead of teaching people how a actually gun works and advising them to keep it in a safe place at all times, this fake salesman literally shames people out of continuing their education. This ad is completely ridiculous to me. First, it is trying to indicate that the gun itself was the reason these people died and then uses that false idea to dissuade people from purchasing their first gun. These guns weren’t what killed all of the people that he mentioned. It came down to either carelessness on the parent’s part or a mentally ill human being who decided to use a weapon to harm other individuals. The basis of this argument is “you don’t want to buy THAT gun. That gun killed all these people.” Not to mention, the whole premise of this video is implying that current gun owners aren’t sympathetic towards some of the shooting tragedies our country has gone through. Finally, this video is extremely one sided. If you want to dissuade someone from purchasing a gun (not that it should be your choice anyway), at least give them all of the facts. Not once did this sales person mention how many times guns have been used in self-defense situations such as home intrusions, sexual assaults, and even to stop public shootings. How about you have an area of the store with guns that were used to SAVE lives? Then let’s see their reaction. I guess momma never taught him not to play with his food. Oh well! This has got to be the best way to cook your bacon. Watch the full video on Youtube –> Click here! With that understanding, it soon became a fact that, even though polymer guns can be accurate, they can never be as accurate as a finely tuned metal framed gun.